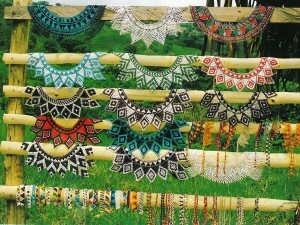 Mola is a traditional handicraft made by Kuna Indian women, which is very famous in the world. Mola means “fabric” or “cloth” in Kuna’s native language and it forms part of the traditional costume of Kuna woman. Mola is now shown at museum and private collections of textile art around the world. And also many Mola lessons are held in Japan. 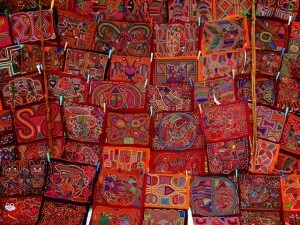 Molas have their origin in body painting and many designs are inspired by animals, birds and flowers. “Chaquira” is the necklace made with beads, shells and bones by Ngobe Bugle native group. It has attractive color and geometric designs. Women wear Chaquira when they participate in parties or important occasions. 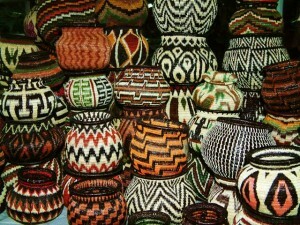 Embera Wounaan Indian women make elegant baskets from fibers and chunga palm which grow in rainforest of Darién. 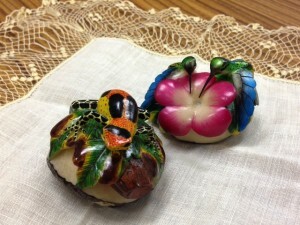 “Tagua” or vegetable ivory is the famous handicraft made by Embera Wounaan native group of Darien. They used the seed of a tree similar to palm tree, which they carve to recreate different kinds of animals that lives in tropical forests. The sale of Tagua products provides an important income for forest people and Indians. 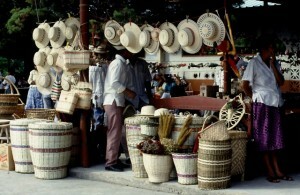 “Sombrero Pintao” is the traditional hat of Panama. “Pintao” means painted hat in Spanish. They are usually made using natural fibers from plants such as rush, a type of reed, bellota or pita. The dark color for the stripes is obtained from the chisná plant, whose leaves are boiled along with the fibers to be dyed. This whole process is handmade, using techniques passed down from generation to generation.